The first thing we need to understand is that the Spanish archipelago to the West of Morocco, the Canary Islands, were not named for the colorful songbird, the truth is the other way around. The Latin name for the islands, Canariae Insulae, translates as "Islands of the Dogs", even though there is little evidence that a large population of dogs was present on the islands in antiquity. There is a supposition that "dogs" refers to a large population of monk seals whose barking call greeted visitors to the area (the Mediterranean Monk Seal, like the Hawaiian Monk Seal, is a critically endangered species and is no longer seen in the Canaries). When Spanish sailors began visiting the islands during the Age of Discovery, they found a yellow-green finch which not only had a beautiful song, was easy to capture and responded well to captivity. Keeping canary songbirds became a fad with the European aristocracy during the 17th when the monks who bred the birds sold only males (who sing as part of the mating cycle, hens do not sing). This helped to ensure the exclusivity of canary keeping, but eventually breeding pairs became available to the general populous. Coal miners probably brought the birds into the mines so their song could help brighten their dark environs, but they soon discovered that the tiny birds were especially susceptible to the poison gasses which collected in some mines. As long as the canary kept singing the miners were safe, but if the bird expired it was time to get out. Miners in Germany's Harz Mountains were able to breed a canary whose song was so melodious that the birds became too valuable for use in the mines, the Harz Roller (local miners began capturing inferior birds for use in the mines). Here is the starting point of our story. Germany was still reeling from the economic ravages of the First World War in 1926 when ambitious Max Stern realized that German thrift and industry would serve him well in America. He set about collecting on old debts to finance his trip to the New World when one friend, a pet shop owner, said that he could only repay with 5,000 Harz Roller Canaries. Stern accepted the birds and negotiated free passage to New York aboard the Hamburg-American Steamship Line. Although he arrived in New York not understanding a word of English, he managed to sell his singing birds at the Astor Place John Wannamaker Department Store. After opening an office at 36 Cooper Square, Stern returned to his native Germany several times, returning each time with more and more of the colorful, melodious birds which he sold to Sears-Roebuck, Woolworths, R.H. Macy, and other retailers. By 1932, Stern was the largest livestock importer in the United States and began supplying feed with the Hartz Mountain line of pet products. A small craze graced the radio waves in the form of Singing Canary programs. One of the earliest examples was the Mutual Network offering, American Radio Warblers on Sunday afternoons from 1937 to 1952. The program was sponsored by American Bird Products, a birdseed supplier, and featured organist Preston Sellers with canaries in cages near the organ. The Hartz Mountain Master Canaries began broadcasting from WGN Chicago. 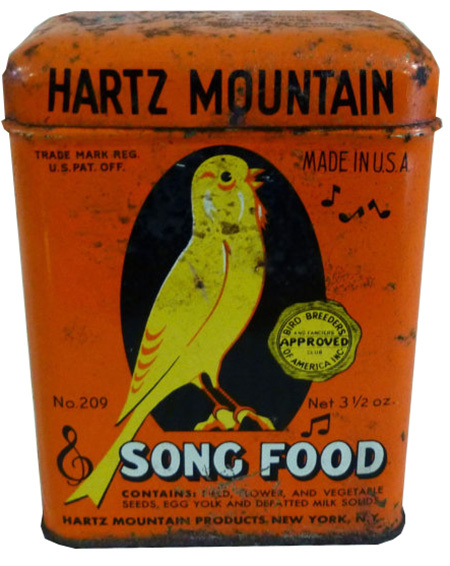 Since the Hartz Mountain line had expanded beyond birdseed, the program featured sketches of other pets pitching products like dog chews and cat toys. Hartz would later be known for their successful line of flea collars. Later editions of Hartz Mountain Canary Pet Show features future 60 Minutes alumnus Mike Wallace as an announcer. Hartz also sold "Instructional" phonograph records which customers could use for their own canaries to learn to sing. Be the first to comment on "Hartz Canaries"